TiVo has today finally launched an iPhone application with is now available to download for free from the Apple iTunes App store and is available for both TiVo DVR and non-TiVo DVR customers. The new application which has been available on the iPad for some time is now available in your pocket allowing you to Schedule TV show/movie recordings and ongoing (Season Pass) recordings, together with the ability to browse the channel guide without interrupting the show you’re watching whilst at home. The new TiVo iPhone application has limited support for TiVo Series3, TiVo HD, and TiVo HD XL DVRs and support for Non-TiVo DVR customers to explore the TiVo App using Guest mode together with Suddenlink and RCN Premiere DVRs. 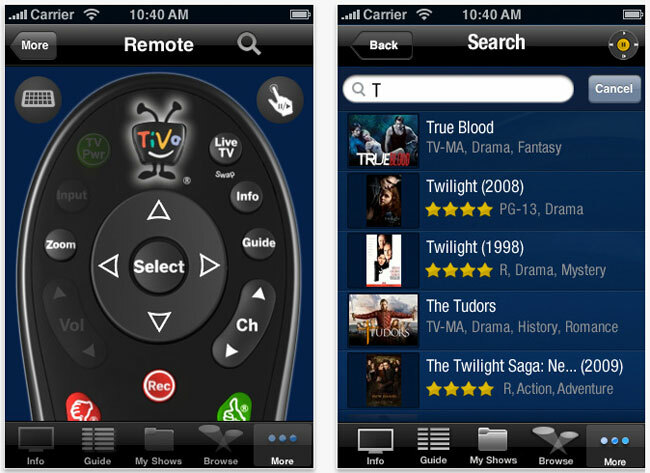 Download the TiVo iPhone app from iTunes now.